The year 2015 was marked by human induced climate change increasingly spiraling out of control – and the struggle for climate justice taking place at ever more fronts. In Paris a global climate agreement was adopted. But was it really about saving the planet? While negotiations and greenhouse gas emissions are in full swing, there are worlds between what would be needed to avert runaway climate chaos and the measures actually being taken. This film portrays three initiatives before and during the World Climate Summit. 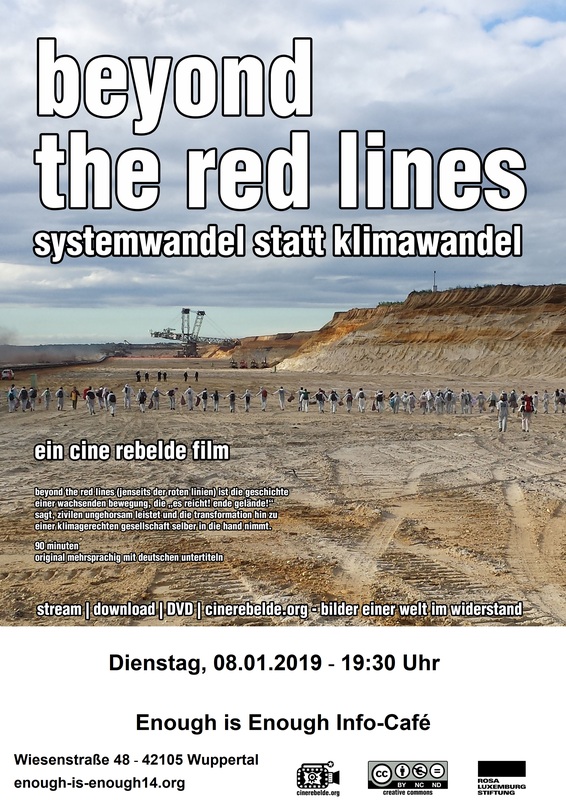 It shows 1,300 people entering a lignite open cast mine and putting their bodies in the way of giant coal excavators in order to paralyze Europe’s largest source of CO2 for one day (Ende Gelände). We hear the voices of people that block the import of fossil fuels at the harbour of Amsterdam (Climate camp „ground control“ & „Climate Games“). We meet people on a 5,000 km bicycle ride to Paris, providing on their way a common voice for a climate just world to countless local initiatives (Alternatiba). Tuesday January 8, 2018 – 07:30pm (19:30), Enough is Enough Info-Café, Wiessenstrasse 48, 42105 Wuppertal, German territory.